In the interest of transparency and quality improvement, we decided to pull back the covers on what makes the MSP 501 the unique measurement that it is today. This year we decided to eliminate the mystery. That’s right, we are revealing the methodology behind the 2016 MSP 501. For background, note that to be considered for the 2016 MSP 501, MSPs were asked to submit confidential applications complete with their 2015 financial results. To qualify for ranking, MSPs were also asked for revenue verification from a certified financial professional for the first time. Data were collected between Feb. 26, 2016 and April 22, 2016. Now for the interesting part. Working with our partner, Clarity Channel Advisors, we gathered input from key MSPs and fellow industry thought leaders, and devised a methodology around revenue. 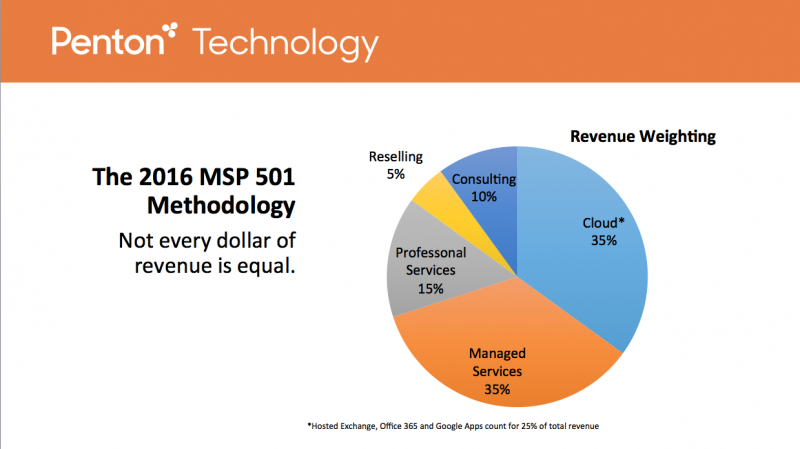 Recognizing that not all revenue is the same—revenue from hardware resell, for example, is generally not as profitable as revenue from managed services—we weighted revenue from different go-to-market activities before making our calculation. We fully expect questions to be raised and debates to follow. But in the interest of transparency and quality improvement, we decided to pull back the covers on what makes the MSP 501 the unique measurement that it is today. what does Tier 1, 2, 3, and 4 mean? bump, what is a “tier 1 MSP”? Too bad they didn’t validate the satisfaction of customers. Ask Sirius how many of their managed customers don’t allow them to manage their systems anymore, but because Sirius sued them they have to keep paying. professional services should be given more weightage.